Former M&A music teacher, Mildred Landecker, 103, passed quietly away in her home on October 8. There will be a Celebration of Life gathering from 2-4 pm on Saturday, Oct. 29 in her home at 3296C San Amadeo, Laguna Woods, CA. Mildred Landecker, 1913-2016, was a musician, teacher, performer, wife, and mother. As a young girl she attended the Juilliard School of Music and then completed both her BS and MA degrees from New York University by the age of 19. For 35 years she was at the High School of Music & Art, where she served as a judge on the Admissions Board and taught conducting, music theory and harmony, voice, accompanying, orchestration, choral ensemble, music history, and piano, while concurrently giving private lessons in her studio at Carnegie Hall and writing 3 music textbooks. After her first retirement and a move to California, for 30 years she taught courses in music appreciation, theory of music, and development of opera at Saddleback College, Emeritus Institute. 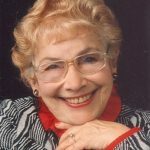 She retired a second time in 2008 at the age of 95 but continued until recently to teach piano and voice privately in Laguna Woods. This 1995 photo commemorates Leisure World’s honoring her as Resident of the Month. Her educator husband of 48 years, Dr. Louis Landecker, died in 1985. She is survived by her son Dr. Peter Landecker, astrophysicist. Read more about Mildred Landecker.